Long used for calligraphy, Chinese ink possesses almost all of the qualities needed to help generate steam using sunlight — a critical strategy for purifying water in a resource-constrained world. From California to Dubai, dry climates, development and growing populations are driving demand for new sources of clean water. Alternative desalination strategies that address energy-intensity and cost would have a large-scale impact. At the U.S. Department of Energy’s (DOE) Argonne National Laboratory, researchers are exploring affordable photothermal materials that could absorb the sunlight necessary to evaporate water and recapture that water, leaving salt and contaminants behind. Instead of trying to heat a whole vat of water, for example, this solar steam approach aims to concentrate heat only at the surface, where evaporation occurs, by covering it with a light-absorbing material. Wood, sponges, fabric and membranes are all good candidates for this purpose, because they can float and are porous enough to let the water seep up and evaporate. But those materials need help heating up under the sun. “We’re looking for dark liquids that we can coat onto porous materials for this application,” said Seth Darling, director of Argonne’s Institute for Molecular Engineering and Advanced Materials for Energy-Water Systems (AMEWS) Center. Ink, of course, quickly came to mind. Darling and a team of researchers including Hao-Cheng Yang, a postdoctoral researcher at Argonne’s Center for Nanoscale Materials (CNM), a DOE Office of Science User Facility, experimented with regular pen ink, but found it didn’t coat uniformly across the varied surfaces. Yang thought back to his upbringing in China, where every child took a class in conventional calligraphy. He decided to explore the traditional ink from his childhood as a coating. Unlike the ink in modern pens, Chinese ink is designed to have staying power on surfaces of all kinds, from fabric to pottery. Made with soot, glue and a preservative, the ancient ink turned out to have the perfect combination of qualities for solar steam generation. 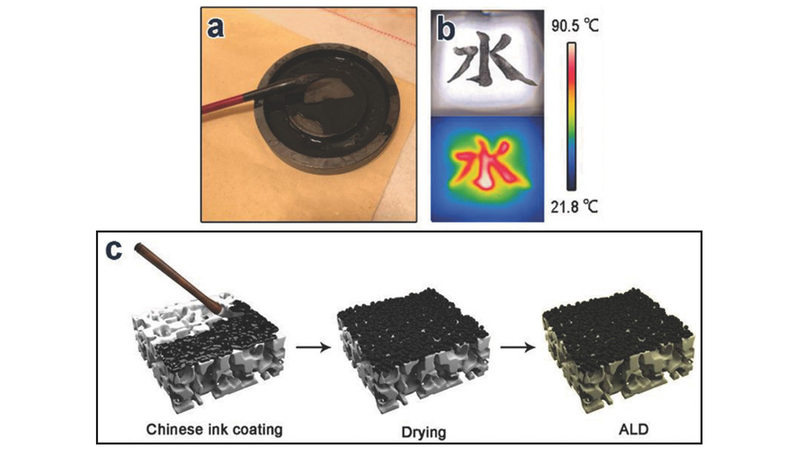 The results of the ink experiments — titled ​“Chinese Ink: A Powerful Photothermal Material for Solar Steam Generation” — were published recently in Advanced Materials Interfaces. In addition to its ability to uniformly coat porous materials, Chinese ink’s viscosity keeps it from penetrating too far down into the substrate. This helps focus the heating right at the surface, where it’s needed. But the carbon-based paint’s biggest asset may be its propensity to absorb light across the visible spectrum and into the infrared range, where most of the sun’s energy lies. One hitch: Chinese ink is water-soluble, so it wouldn’t last long on its own in a steamy setting. The researchers used atomic layer deposition, a technique for depositing thin films, to apply a transparent coating of titanium dioxide over the ink, sealing it in place. Tested under simulated sunlight on various substrates, including wood and sponges, the combination proved to be a stable, potent steam generator. The coating integrates materials with broad light absorption, strong coating capability, water-attracting properties and extreme durability — a challenging set of characteristics to assemble into one system. Researchers at the Institute for Molecular Engineering and Argonne’s recently awarded AMEWS Center continue to explore materials and technologies that purify and conserve water. “Time will tell if Chinese ink — or some other fluid with similar properties — will see practical use out in the field,” Darling said. But its low cost, versatility and abundance make Chinese ink an indelible addition to the choices.